Dr. Rajeev Sood is one of the top Urologists in India with more than 35 years of experience. Dr. Rajeev Sood (Director Urology, Robotics & Renal Transplantation) has to his credit the first cadaver renal transplant and the first laparoscopic live donor nephrectomy in the Armed Forces and has done more than 1500 renal transplants. Dr. Rajeev Sood is also the driving force behind the Laser Prostatectomy program in the country. Dr. Rajeev Sood is one of the best Urologists with more than 35 years of experience. He is working as Director and Consultant in Urology At Rajan Dhall Hospital. 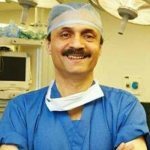 Dr. Sood has trained in Urology in AIIMS Delhi, Cryosurgery in University hospital, Virginia and Prostate Surgery in Kings Hospital, London. He is one of the top Urologists in India. Vishisht Seva Medal conferred by the president of India for performance beyond the call of duty. Gold medalist in MBBS, MS, MCh. MS, DNB (General surgery), MCh, DNB (Urology).